Will future medical bills be paid by my Iowa Workers' Compensation? Will my future medical bills to treat my injuries be paid by my Iowa Workers' Compensation? If you have suffered from a work injury in Des Moines and your Workers' Compensation claim is approved, your future medical bills may be paid. According to Iowa law, if you were injured while on the job, your employer's Workers' Compensation coverage is responsible for paying for all medical care necessary to treat your work-related injury. When your employer and/or their insurance company is responsible for your work injury in Des Moines, they will get to choose your medical providers. The right to medical care and treatment may continue for the rest of your life for conditions related to your work injury or occupational disease. 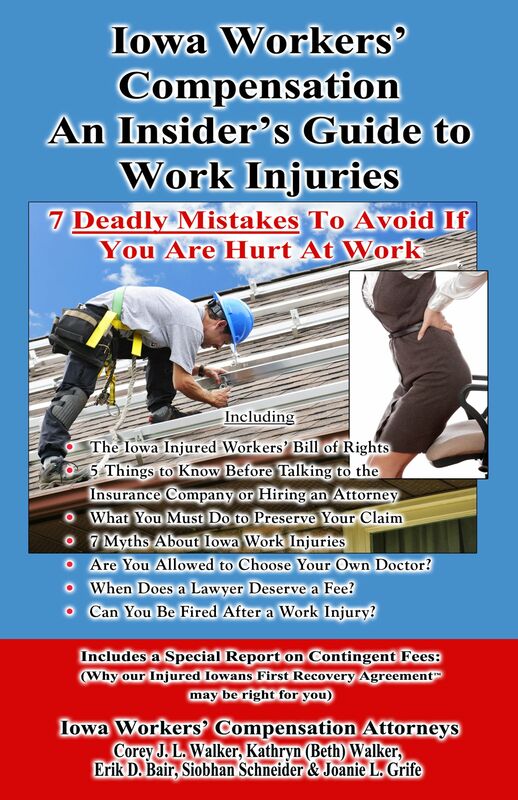 On the other hand, if you have suffered from a work injury in Des Moines and your Workers' Compensation claim is denied, your future medical bills will not be covered. Just because your claim was denied does not mean that you don't have a case. With the help of a Des Moines Workers' Compensation lawyer, you can appeal the denial of your claim. In an appeal, your Des Moines Workers' Compensation lawyer can present evidence that pertains to your case, submit the testimony of experts and do their best to help you get the money that you deserve. An injury in the workplace can have devastating consequences. The Des Moines Workers' Compensation lawyer team at Walker, Billingsley & Bair work hard to level the field between injured Iowans and insurance companies. To learn more about what our legal team will do to help you protect your Iowa injury claim, contact Walker, Billingsley & Bair to schedule a no-cost consultation - 1-888-435-9886.